This is one of the larger mounds shown on the Patrick Map. It is located on the bank of Cahokia Creek immediately west of the point where Canteen Creek flows into Cahokia Creek. Generally, the Patrick Map suggests an east-west, north-south orientation. 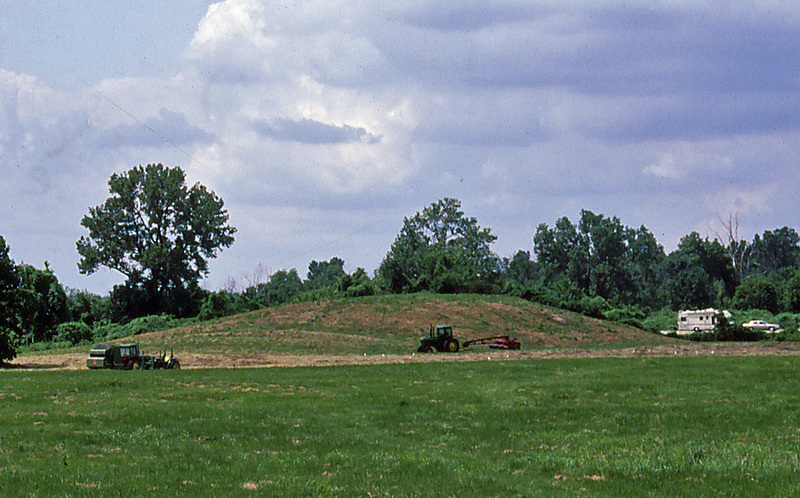 Mound 5 appears to be one of the better preserved mounds at Cahokia, as it still resembles the rectangular platform present in Patrick’s time. If one assumes the base line of this mound is 126 meters above sea level (413.4 feet), its north-south limits are N520 and N586, and the east-west limits are E358 and E426. This gives a north-south dimension of approximately 66 meters (216.5 feet) and an east-west dimension of 68 meters (223.1 feet). Using the base of 126 meters (413.4 feet), the highest elevation on the mound is 131.8 meters (432.4 feet), giving a present height of 5.8 meters(19 feet). These figures are compatible with the previously reported dimensions of the mound. McAdams, in 1882, reports a height of 25 feet (7.6 meters). Cyrus Thomas, in 1894, gives a height of 30 feet (9.1 meters), and the Peterson-McAdams Map of 1906 notes a height of 25 feet (7 .6 meters). The difference between the 25 feet given by McAdams, which is probably more accurate, and the present 19-foot height could be largely due to siltation around the base or slope wash that has obscured the true base of the mound. It appears that this mound was not excavated by previous investigators. Moorehead only refers to it in his 1923 volume (Moorehead 1923:48). In 1960 and 1961, during the Highway Salvage Program, the Illinois State Museum dug a stratigraphic trench into the north side of Mound 5. Mound 5 is an excellent representative of a square to rectangular platform mound. This was probably a substructure mound upon which a building once stood.